A League of the South member has been arrested in Florida and charged with beating a man after the “Unite the Right” rally in Charlottesville, Virginia, in August. The FBI and the Clay County, Florida, Sheriff’s Office picked up 49-year-old Tyler Watkins Davis on Wednesday, January 24, at his home in Middlesburg, in northeast Florida. Davis is the fourth person charged with beating 20-year-old DeAndre Harris after the rally turned violent. Jacob Scott Goodwin, Daniel Patrick Borden, 18, and Alex Michael Ramos, 33, were charged with "malicious wounding" in connection with an assault at the rally. All three have pleaded not guilty to malicious wounding. Police say Harris was attacked by a group of white supremacists in a parking garage and beaten with pipes, wood slabs and poles. Davis, who is heavily tattooed, can be seen in a video of Harris being beaten wearing a “Boonie Hat” and all-black clothing with a League of the South logo on the shirt. Davis is a charter member of the “DB Coleman chapter of the Florida League of the South” based in Middleburg. The arrest of Davis, who was being held at the Clay County Jail pending extradition to Florida, comes days before the League of the South is scheduled to hold a rally at the state capitol in Tallahassee, about 160 miles west of where Davis lives. The League, a neo-confederate organization that seeks to establish a white, Christian ethnostate in the southeastern U.S., didn’t reveal a theme for Saturday’s gathering. 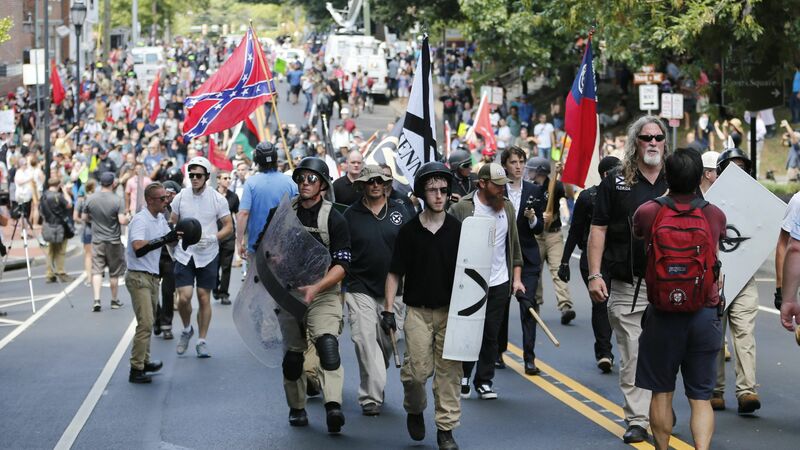 Tyler Watkins Davis, center in "boonie" hat marched with League of the South chief of staff Michael Tubbs (grey beard) at Unite the Right in Charlottesville before allegedly assaulting a black man in a parking garage. After police arrested Davis, Florida LOS national chief of staff and felon Michael Tubbs took to the alt-right social media platform Gab to plead for help for Davis. The Unite the Right rally also saw the arrest of 20-year-old James Alex Fields, Jr., who is charged with murder in the death of 32-year-old Heather Heyer. Police say Fields rammed his car into a crowd, killing Heyer.